Hey O&G fans, we got a chance to check out fathom eventsscreening Batman and Harley Quinn with a Harley Featurette after the movie. The NYC 14th Street Regal Union Square was packed with both Batman and Harley Quinn fans. There are legions of DC Animated movie fans and Batman and Harley Quinn did not disappoint! The film features a stellar cast with The Big Bang Theory star Melissa Rauch voicing Harley Quinn for the first time. THE VOICE of Batman, Kevin Conroy reprising his role from Batman the animated series and Loren Lester as Nightwing rounding out our cast of heroes. Paget Brewster (Criminal Minds) and Kevin Michael Richardson (The Cleveland Show) provide the voices of the villainous duo of Poison Ivy & Jason Woodrue. Sam Liu (Batman: The Killing Joke) directed the film from an original story by Bruce Timm (Batman: The Dark Knight Returns) with a teleplay written by Timm & Jim Krieg (Justice League: The Flashpoint Paradox). Co-Producer is Alan Burnett (The Batman). Executive Producers are Sam Register and Bruce Timm. Benjamin Melniker and Michael Uslan are Executive Producers. This was a more comedic take on DC Animated movies and for me it was done very well. Melissa Raunch was an awesome Harley Quinn! She really bought out the Brooklyn in Harley's voice while keeping true to the character. Batman is always voiced brilliantly by Kevin Conroy, but this film showed more of his comedic side while still trying to be the normal serious brooding Batman. The story centers on Poison Ivy (Paget Brewster) and the Floronic Man (Kevin Michael Richardson) teaming up to transform all life on Earth into plant hybrids by using the research that Alec Holland created before he became Swamp Thing. This is more of film about Harley trying to change her life and be a bit more heroic. It also reinstates the deep friendship that Harley and PIOSON IVY have. The film if filled with a lot of crude humor and fart jokes (and literal farts). We also get a musical number from Harley in what looks like a Batman 1966 hideout with villain henchman included. 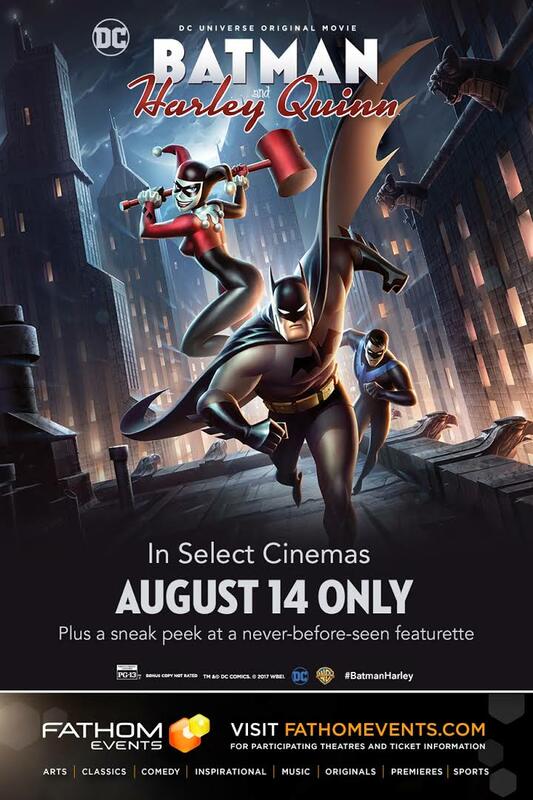 Over all the movie was pretty good with a few bumps in the story, but definitely a film true Batman and Harley fans should go see. I want to again thanks Fathom Events for the Invite and a Chance to see this DC animated movie.